Storage of unencrypted Personally Identifiable Information (PII) creates liability to fines, penalties and fees associated with the Payment Card Industry (PCI), Health Insurance Portability and Accountability Act (HIPAA), the General Data Protection Regulation (GDPR), as well as possible data compromise. 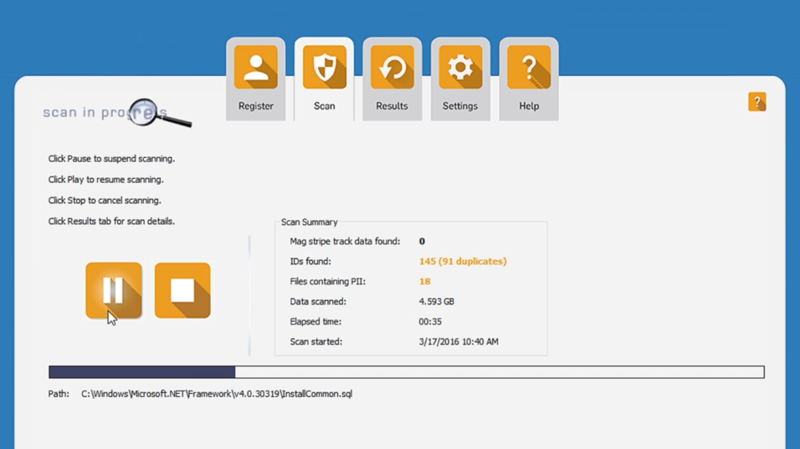 SecurityMetrics PIIscan is PII scanning software that searches computer systems, hard drives, and attached storage devices for unencrypted data to help you discover where and why sensitive data is leaking from your network. SecurityMetrics PIIscan is data discovery software that allows organizations to simply and efficiently discover unencrypted USA Social Security Numbers (SSN), UK National Insurance Numbers (NINO), Canada Social Insurance Numbers (SIN), Australian Tax File Numbers (TFN), Australian Business Numbers (ABN), and payment card data (including primary account numbers (PAN) and magnetic stripe track data). It is important to proactively find and then delete or encrypt this sensitive data before criminals can steal it. 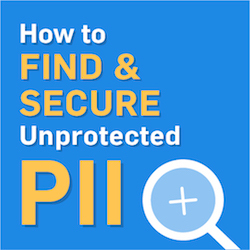 Why waste time manually searching for PII on your computer systems? 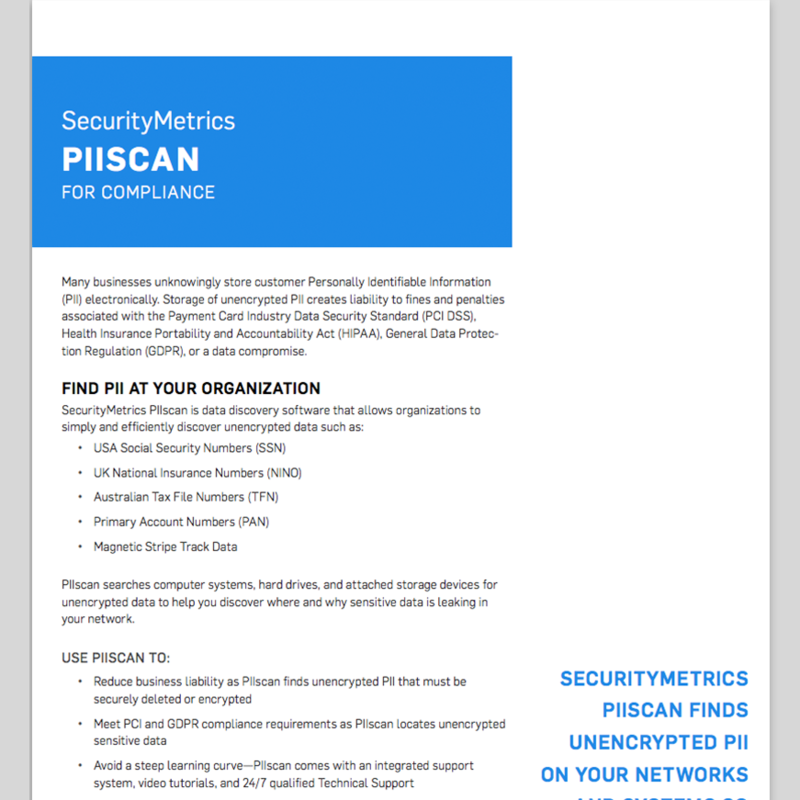 SecurityMetrics PIIscan takes the weight off your shoulders and simplifies sensitive data discovery. Once the scan is complete, you can use the results to work towards compliance with PCI, HIPAA, and GDPR requirements. 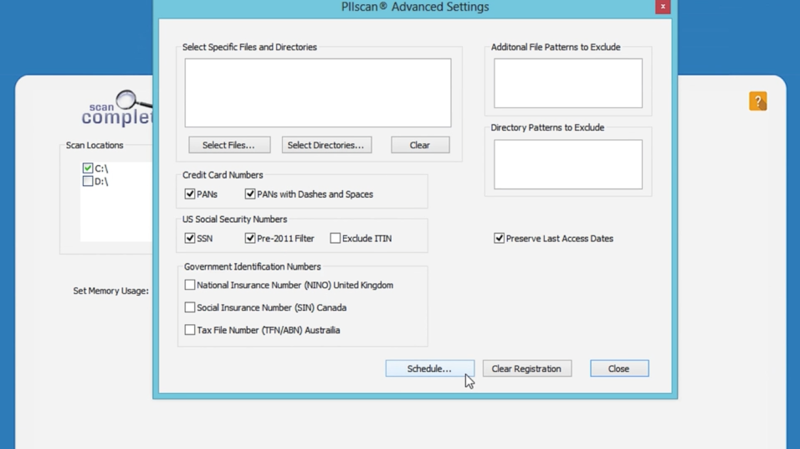 PIIscan was built with security in mind and never collects or stores SSN, NINO, TFN, ABN, or payment card data. SecurityMetrics leverages digital forensic investigation technology to fine tune PIIscan and find unprotected sensitive data at your organization. 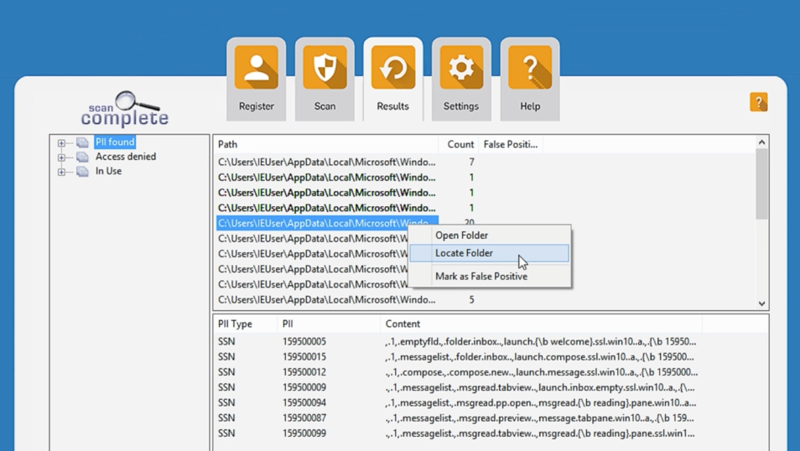 The patented PII scanner technology in PIIscan allows you to configure your scan to search or not search for spaces and dashes, graphic files, and image and executable files. You also have the option to run the PII scanner in forensics mode to maintain last access dates on files. You can also choose to include or exclude SSN, NINO, ABN, TFN, or payment card data from any of the scans you run. Our 24/7 support specialists can help you locate and securely delete or encrypt unencrypted PII. Our award-winning support team reviews sensitive data discovery best practices and helps your organization stay secure. Sensitive data discovery is an important part of achieving security and complying with PCI DSS, HIPAA, and GDPR requirements. Businesses can locate unwanted data, then securely delete or encrypt it. PIIscan is simple to use and configure, even for tech novices. 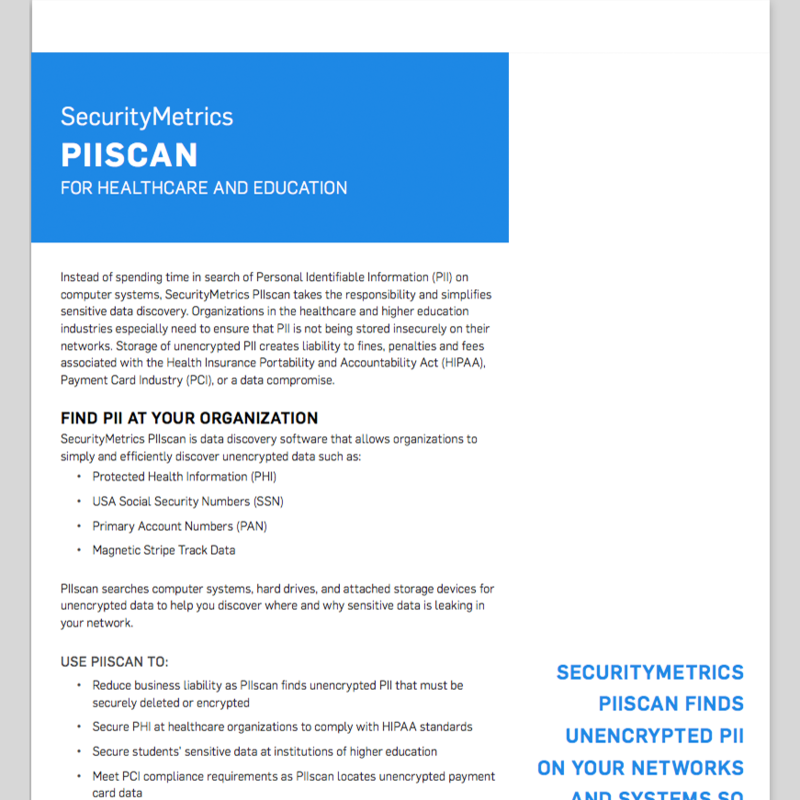 PIIscan does the work to help you keep unencypted data out of your network and systems. Often PII scanning software is overloaded with false positives. 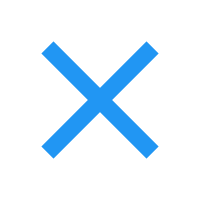 PIIscan’s proprietary algorithms minimize false positives, ultimately saving you time. With expertise in PCI DSS assessments, HIPAA assessments, GDPR, forensic incident response, vulnerability scanning, penetration testing, card data discovery, security appliances, PA-DSS security assessments, P2PE assessments, training, and consulting, we hold a myriad of credentials and can help secure your data. Check out PANscan to only scan for credit card data.